TA3001 wrote: What exactly has caused the rapid downfall with many modern (and mainly suburban) bus body designs in Australia? We're probably beginning to diverge from the topic at hand here. And I'm not interested in another Volgren vs Customs vs Bustech (etc) debate. What I will do is point out the obvious. We have State Governments who, for better or worse, chase votes through local content requirements. That's the first problem - in Australia, you're creating these isolated little pockets of manufacturing that can't necessarily produce all that efficiently*. Then you have Governments with limited budgets effectively awarding tenders for the supply of vehicles to the lowest bidder; Australia is a relatively expensive place to manufacture goods (high wages, costs associated with sourcing components not produced in Australia from distant overseas manufacturers, Government regulation) so straight away there will be some sort of tradeoff when these small, inefficient and costly manufacturers are asked to produce something "cheaply." The result is an end product that is built to a price, rather than to a standard. There are instances where this isn't necessarily the case, but to raise a frequent topic of discussion; this is likely the reason why fully low floor vehicles, with multiple doors haven't gained traction as quickly as elsewhere. It is also why enthusiasts and non-enthusiasts alike notice fit and finish issues with even brand-new buses, crap ergonomics for the driver and other peculiar design niggles. *I'm not suggesting manufacturing is best lost to overseas, only pointing out that small, low-scale, isolated manufacturers wouldn't be as efficient as a more centralised operation in some part of the country. This also creates a barrier to potential competitors who have not established themselves in a particular state; if they were to setup a factory locally, winning a supply contract over a competitor could decimate the jobs of one firm in favour of another which wouldn't be a good look for the Politicians. TA3001 wrote: I'm not sure if Volgren still have that quiet ding sound when the button is pressed, but I know Bustech includes the 'next stop requested' when the button's pressed, and Custom ones now has that horrible unpleasantly loud jackpot tone which follows the simple beep. The beep is the only sound audible in the ex Sydney Iveco CB80s though. Well, most Optimus buses/Optimi in Perth have that ear-popping buzzer, but I've observed that Transperth/Transdev bus 2165 (Volvo B7RLE/Optimus) has the bell sound rather than the buzzer. 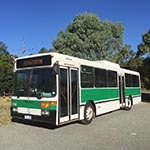 Bus Suggestions wrote: Well, most Optimus buses/Optimi in Perth have that ear-popping buzzer, but I've observed that Transperth/Transdev bus 2165 (Volvo B7RLE/Optimus) has the bell sound rather than the buzzer. That's disgraceful. You should put in a complaint about it if it's annoying you to the point where it's an assault on your ears. It is not acceptable in my opinion for passengers to be disturbed by bus body design flaws. The latest deliveries in the 2900-series now feature a stop-request "Bell" recording rather than the buzzer/bleep... What was wrong with a physical bell, I'll never understand. Good news for TA3001! Transperth seem to now be fitting the "bell" recording onto all their buses that originally had a buzzer, in addition to new deliveries! I tend to cringe nowadays when I hear the term 'new bus'. But this is because the oldest ones which they're stealing the spots of aren't just another bus to me anymore. And I have never traveled on Perth PT at all, so it looks like you'll be the one that's happy about the tone being less ear piercing. I know that this topic has been dormant for nearly 2 months, but I went on a new Bustech vehicle yesterday, and there are obvious design flaws. Apart from feeling like I'm sitting inside a container, there were very loud nonstop squeaks which did get to me even after just 10 minutes of being aboard. I personally find the internal paneling (it's like the dot matrix on bus destos) to be a tiny bit irritating, but I can't pinpoint exactly why. I have a feeling that they may be equally or even more unsturdy than the Custom Coaches jackpot CB80s. But then, it has now became impossible to design a user friendly suburban bus in today's era that will not cause irritation towards passengers, unlike in the 2000s where it was done without minimal trouble and cost blowouts. TA3001 wrote: I know that this topic has been dormant for nearly 2 months, but I went on a new Bustech vehicle yesterday, and there are obvious design flaws. Apart from feeling like I'm sitting inside a container, there were very loud nonstop squeaks which did get to me even after just 10 minutes of being aboard. I personally find the internal paneling (it's like the dot matrix on bus destos) to be a tiny bit irritating, but I can't pinpoint exactly why. I have a feeling that they may be equally or even more unsturdy than the Custom Coaches jackpot CB80s. I asume this is in Adelaide and it's one of the Precision-built buses, it which case it's not full low-floor? I would be interested to see interior and exterior photos of these buses though, to see how they resolved the issue of the window-line being too high for seated passengers to see out. Perhaps on the Adelaide section would be more appropriate. It's obvious that convenience is ahead of quality and customer satisfaction. But then the DPTI in SA is happy with anything that's accessible and runs on diesel, no matter unreliable, and poorly built it is, due to the cost being handed over to the operators. There's only a tiny number of fully low floor buses in Adelaide. What is wrong with low entry anyway? I don't quite get it. The Adelaide built NL202s don't even permit wheelchairs/prams to enter through the front. They have to enter through the centre door which is a bit of a nuisance to the driver. But I've heard that some drivers actually like this due to more room being available. I've actually heard of them accommodating up to 70 passengers. I've also noticed some drivers mentioning what is a nuisance to squeeze a gopher or any other large mobility device through the front of a CB80. I think the 2nd hand Volgren ones allow front entry. Several fold out seats in the wheelchair/pram areas have been removed on many diesel NL202s. Without these seats, these buses effectively have 36 seats, which is only 6 more than the MAN 11.190s which were withdrawn from 2015 and onward. Full low-floor allows mobility-impaired and elderly (the issue is far more than just wheelchairs) access to the full length of the interior, encourages crowds of standees to distribute themselves right to the back of the bus rather than stalling at the steps and the bus going off half-full and leaving people behind, and eliminates a safety hazard (steps). Wheelchair access at the second door is pretty standard in Europe. It enables direct access to space directly opposite the door rather than having to turn down the aisle and trundle down the bus that you get with front-door access. This then enables the aisle from the front door to be narrowed a little to get more seats in down the front (2+2 or 2+1 abreast rather than only 1+1). Is there a price difference between say the Scania NXXXUB, and the KXXXUB due to the former being fully low floor? I wonder if there are any potential security issues with centre door entry for mobility devices. Leaving the driver area unattended with no other passengers aboard is surely an issue that there has to be a workaround for. I don't personally like the N280UB that is currently in service. I've always had a preference to sit somewhere behind the centre door, with an elevated view. The SL202s in service are fine in this regard, despite the seats being mostly level. I suspect it's a leftover from catching high floors almost exclusively until the 2000s. I personally don't like my head being level with the passenger right in front of me. In full low-floors, the seats rear of the centre door are still elevated just like the seats in a low-entry, because of the wheel arches and mechanicals. It's only the aisle that is low and stepless. AS I get older, I must admit that full low floor buses do make a lot of sense and that nothing can really be done about plinths and other bits and pieces towards the rear of the buses. One thing that I am really looking forward to is some time in Finland a little later this year. The Scandinavian countries including Finland (which is sometimes included and sometimes not) do produce some wonderful urban bus bodies, which take full advantage of the most technically innovative chassis and this does particularly include the interior layouts. Back in the mid 1970's I spent two months in the area and was totally impressed with wide entrance and obstruction free layout of the locally bodied Volvo B59's. By comparison Adelaide's large fleet of B59's had narrow entrance and exits with highish floors which did not take full advantage of the low chassis layout. I must admit that I saw less of a gap in body styles and layouts between the Scandinavian and our bodies in subsequent years - last time I went to Finland was in the height of winter and we spent most of our time up in the north, where buses were limited in number, daylight hours were below 3 and temperatures were below minus 35c - little encouragement for bus travel and observation! Tim Williams wrote: AS I get older, I must admit that full low floor buses do make a lot of sense and that nothing can really be done about plinths and other bits and pieces towards the rear of the buses. One thing that I am really looking forward to is some time in Finland a little later this year. Finland is a beautiful country but don't get too excited on the bus side of things! At least in the northern parts I visited, bus frequencies are still pretty poor too (albeit it was also middle of winter for me). In Scandinavia, Finland and Estonia, aside from the busy inner city routes, you won't see many fully low floor buses these days. Low-entry buses are usually favoured for many applications although their size and layout is often quite different to Australian cities. For example, more often than not, these low-entry buses typically have three axles and are longer than 12 metres (usually between 13 to 15 metres). It is also common regardless of length to be equipped with three doors (up to four doors on low-entry artics) - front and centre double-leaf and rear single leaf with step down. Depending on where you go, some cities allow all door boarding, others don't. The buses are suitable for the longer suburban running although bizarrely, they are commonly used throughout inner Copenhagen where only one bus line is operated with fully low floor buses - City Line 5C which is one of Europe's busiest bus lines with annual patronage of about 20 million passengers. This service is operated by CNG powered MAN Lion's City G 18.75m articulated buses equipped with five doors and the only line with all door boarding. If Sydney's inner city services isn't enough to see the inappropriateness of low-entry buses on busy inner city routes, then Copenhagen will certainly be an eye opener in that regard with the claustrophobic nature of their buses! Many parts of Helsinki are served by trams and the metro - the latter is more akin to Sydney's Metro operating more of a suburban function rather than for CBD distribution. From memory, the few inner-city bus routes that do exist are using low floor buses but with the city well covered by tram and metro, buses are relegated to mostly longer suburban trips or feeder function to commuter railway and metro stations in which low-entry buses (most of which have three axles) with higher seating capacity are more appropriate (as for longer suburban journeys of a similar nature in Sydney). Unfortunately many bus industry people don't understand the issue until they get to this point and by then it is too late for them to have any influence to do anything about it! Of course it's also about more than accessibility, notably the issue of improving the productivity of buses by getting them filled to capacity as, with the typical front-door entry arrangement, crowds typically stall at the aisle stairs and the bus goes off only half full and people are left behind at bus stops. The thing about Scandinavia (and the Baltic countries) generally is that the population is quite small and public transport usage, though good by Australan standards, is more modest by European standards and the pressures aren't there (as was the case in much of Australia until recently) to think too hard about better bus design. Look at where the low-floor bus evolved - the Renault/Iveco design that became the almost universal citybus throughout high-population/high PT usage countries like France, Italy, Czech Republic, Poland and further east into Eastern Europe. In these countries you'll see near-universality of low-floor citybuses. In order to handle massive crowds even better, the Czechs went further and pioneered the four-door low-floor 12 metre and five-door low-floor artic, the latter layout having since been picked up by MAN, like the Copenhagen bus mentioned by Mr OCB. There are now several low-floor chassis available on the Australian market but the local industry is not very attentive to end-use issues. A good example is the Yutong E12 electric bus demonstrator that has arrived in NSW and is now in service on the south coast. The E12 is a fully low-floor bus, whether in LHD or RHD and comes in one or two door format or, in Europe, in three-door format. Everywhere around the world where the E12 is in service (including countries as diverse as UK, Chile and Bulgaria) it is a low-floor bus - until this example arrived in Australia where the local Yutong distributor made a decision that it should have a high floor at the back!!! With the assistance of the ABC bus magazine, which has previewed the vehicle, the local Yutong man was tracked down for an explanation. His answer was imprecise but boiled down along the lines of "this is what the local industry expects". He also tried to explain that the only reason the Europeans required a fully low-floor is the third door at the back - yet the low-floor E12s in Paris only have two doors, so how does he explain that? Absolutely no comprehension of the issues surrounding its functionality as a mass transit vehicle. You couldn't make this up. There is nothing in the bus mechanicals or electrics that actually needs to go under the aisle. The Chinese have taken their lessons from the Europeans about packing equipment under the seat platforms at the sides and at the back. Perhaps the local distributor has fitted some extra bit of equipment, taking the easy option, and hasn't bothered looing for space under the side and rear platforms, but somebody I have spoken to who has seen under the bus says that there is nothing of significance under the rear aisle. I think it's now boiling down to the fact that the Australian bus sector (agencies, operators and manufacturers/distributors) have fallen into a lazy mindset and are not rising to the challenge of providing the necessary engineering solutions to the huge rises in patronage that are now occurring as population growth, fed by immigration, is swelling the size and levels of activity of our cities. Many years ago, the late Geoff Johnston, editor of "Truck and Bus Transportation" lamented that the Australian bus industry was run by mechanics, not by passenger transport people. I feel that that hasn't changed much since. tonyp wrote: I think it's now boiling down to the fact that the Australian bus sector (agencies, operators and manufacturers/distributors) have fallen into a lazy mindset and are not rising to the challenge of providing the necessary engineering solutions to the huge rises in patronage that are now occurring as population growth, fed by immigration, is swelling the size and levels of activity of our cities. Many years ago, the late Geoff Johnston, editor of "Truck and Bus Transportation" lamented that the Australian bus industry was run by mechanics, not by passenger transport people. I feel that that hasn't changed much since. Well said! I no longer post on this forum on a regular basis, but I just have to add my two cents here. If you look at the advertising in industry periodicals, you will find all that you need to know. Buses are advertised based on their ease of service, warranty length and mileage cap, number of seats and "reduced operating costs". While I agree that the above list of "features" has importance and relevance, one needs to remember that it's the passengers that form the "bread and butter" of the bus industry and that aesthetics and practicality should be taken into consideration as a higher priority if operators are serious about improving passenger satisfaction. Furthermore, it seems that the driver (who is the person that has to spend 10 hours behind the wheel dealing with any of a bus's shortcomings) is not particularly well catered for in comparison to their European counterparts. Most, if not all European buses feature dash and steering wheel modules that are both height and reach adjustable together, meaning that it is unlikely that a driver cannot find a comfortable driving position. And then you have the issue of build fit and finish. Not naming any specific builders, but whoever thought that it was good idea to hide vehicle electronics with rattly fittings above a driver in a compartment enclosed with fibreglass hatches held together with cheap locks with in many cases excessive play needs to be shot. There are also too many operator-specific ergonomics issues (e.g. multiplexing screen installed too high with controls installed on the opposite side of the driver's cab down low!) that have the potential to affect driver's comfort levels. I personally love the idea of a high driving position (e.g. Irisbus Citelis) but prefer the cab layout of the current MAN products.